I want to take a moment and explain a bit of frustration. 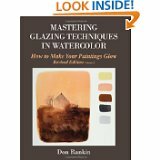 Many of you have been buying Mastering Glazing Techniques in Watercolor, Vol.I directly from my create space site http://www.createspace.com/3657628 others have been going to Amazon Books. Currently at Amazon books the first image /icon that comes up is the OLD out of print edition with the white cover. If you click on it and or read the copy it will tell you that the book is not for sale on their site! If you click around a bit you will eventually find the paperback edition of about $31.00. Down below that entry on the Amazon page you will find two images of the revised edition offered for sale at enormous prices! Unfortunately a part of the Amazon team sees no reason to modify or change the layout! I have discussed this issue with my Create Space support team. They are working on the issue. We have no idea how it happened but it is a mess to put it mildly. So to recap, if you buy, you want the revised edition and it is only about $31.00 USD!! I’m sorry for any confusion.